Young Malec was not alone. That same phrase or words very similar could be heard shouted to boys dressed in oversized catcher’s gear by coaches and parents at thousands of baseball fields across our country. 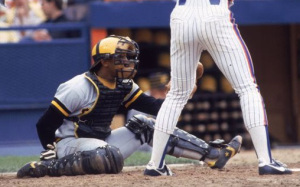 It was against protocol and considered taboo for a catcher to let his buttocks come in contact with the dirt when assuming the catchers’ crouch position to await the next pitch. So every time Coach Aldi would ask me if I wanted to catch, I would quickly say no because I did not want to have anybody yelling at me to keep my rump off the ground. Pena sat on his rump waiting to receive every pitch thrown to him in 1,950 games during the eighteen-years he spent in the big leagues. That put him in fourth place on the all-time Major League list for most games caught. He wore a Red Sox uniform for 534 of those games. Boston signed this native Dominican as a free agent after the ’89 season for four years and $9 million. He spent those next four years as Boston’s starting catcher. By then, Pena was no longer the .280 hitter he had been during his early years with the Pirates but he could still handle his responsibilities behind the plate. 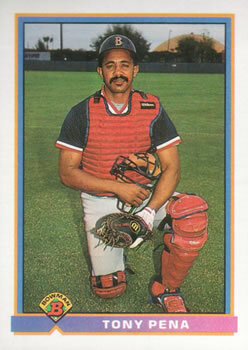 In fact, he won the AL Gold Glove for catchers during his second season with the Red Sox, in ’91. When his average plummeted into the .180s during the final year of his contract, however, it made the decision to not re-sign him easy for Boston’s front office. He then moved on to Cleveland, where he backed up and mentored Sandy Alomar Jr. for the next three seasons. The five-time All Star retired after the 1997 season with a total of four Gold Gloves, 1,687 career hits and a lifetime average of .260. He is now the highly-respected bench coach for the Yankees. For one brief shining moment in his Major League career, it looked as if Rick Cerone was becoming the heir to the Dickey-Berra-Howard-Munson succession of great Yankee catchers. The moment actually lasted for one entire regular season and 147 games in 1980, the year after Munson died. New York had acquired Cerone from the Blue Jays during the offseason and thrown the then 25-year-old Newark, New Jersey native into the huge empty space behind Yankee Stadium’s home plate to see if he would sink or swim. He responded with career highs in home runs with 14, RBIs with 82 and a .277 batting average, quickly becoming a hit with Yankee fans. The shining moment then ended for Cerone almost as quickly as it began, spurred on by two events. The Yankees lost an ALCS for the first time in their history after that 1980 regular season and in 1981, Major League went on strike. Cerone hit just .244 during the strike-shortened season and then got into a famous locker room argument with “The Boss” during the ’81 World Series, putting his Yankee career on much thinner ice. Cerone’s batting average over the next few seasons fell into the toilet and by 1985 his Yankee career was over, when he was traded to the Braves. He would make seven more moves during the next eight seasons and one of them was to Boston, where he was signed as a free agent at the beginning of the 1988 regular season to serve as Rich Gedman’s backup. He did fine in that role, getting into 84 games and averaging a decent .269. In 1985, he actually caught more games for the Red Sox than Gedman did. By then, however, Cerone was in his mid thirties and one of his traditional strengths behind the plate, a strong throwing arm, had begun to desert him. Boston let him walk at the end of ’85 and he ended up walking all the way back to the Bronx and re-signing with the Yankees. He retired as a player after the 1988 season, his 18th year in the big leagues. 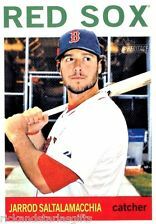 When the Red Sox acquired catcher Jarrod Saltalamacchia from Texas for three prospects at the 2010 regular season trading deadline, I did not think this native of West Palm Beach, Florida was going to start behind the plate for Boston. He had been only a backup receiver since making his big league debut with the Braves in 2007. Though injury prone and not very good defensively, Vic Martinez was hitting the ball very well as the Red Sox starting catcher in 2010. I figured “Salty” was being picked up at the time to replace second stringer Jason Varitek, who was nearing retirement. Then at the end of that season, Martinez’s contract expired and Boston let him sign with the Tigers. I was still expecting Boston to swing a deal for a starting catcher, but when Opening Day came around the following year, the switch-hitting Saltalamacchia had that job and the veteran Varitek was now his backup. He ended up remaining the team’s top receiver during his three complete years with the Red Sox and though he was by no means an All Star at the position, he did perform admirably, especially offensively. He slugged a career high 25 home runs in 2012 and then increased his batting average by 50 points during Boston’s World Championship 2013 season. After his success in Beantown, I did believe the Red Sox would re-sign him after the World Series. Again they surprised me by letting the Marlins grab Saltalamacchia while they signed the veteran A.J. Pierzynski. 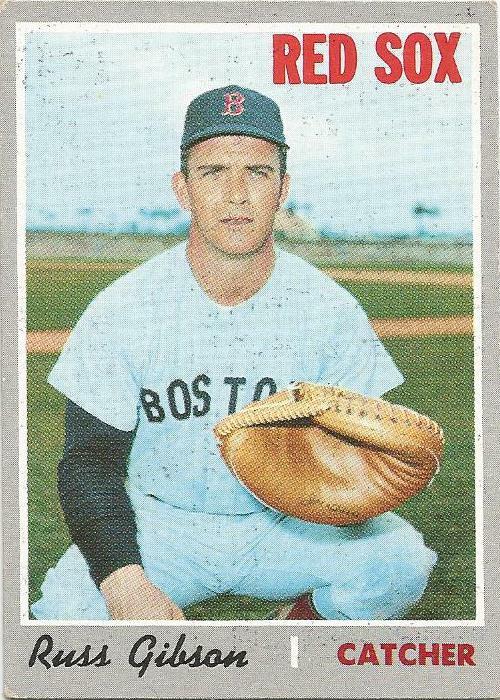 Another former Red Sox born on this same date is Eddie Bressoud, who made the AL All Star team when he started at shortstop for Boston back in the 1960s. Jake Stahl is one of just 11 Red Sox players to have won AL home run titles. He performed the feat way back in 1910, during the Deadball Era, which helps explain why Stahl’s 10 home runs were enough to lead both leagues. He’s also one of just six Red Sox managers to win a World Championship with Boston. A native of Elkhart, IL, Stahl starred in both baseball and football for the University of Illinois before making his big league debut with the Red Sox as a backup catcher with the 1903 team. 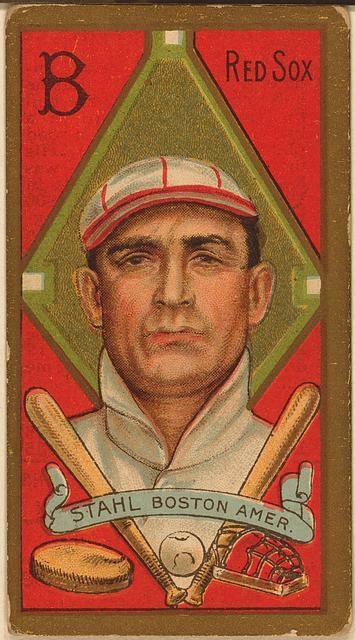 Boston then sold him to the Washington Nationals where Stahl was immediately inserted as that team’s starting first baseman. At the time, the Washington franchise was barely surviving and being run by AL President Ban Johnson until new ownership could be found. 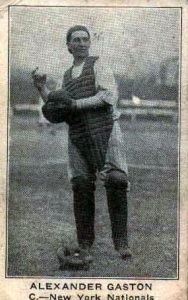 Johnson liked the college-educated Stahl so much, he made him the team’s player manager in 1905. Though he had some early success in that role, the team then faltered and Stahl was traded to the White Sox in 1906. By then he had married a girl he met in college, who had a wealthy businessman for a father and Stahl had started a second career in the banking business. He probably would have retired from baseball then and there except for the fact that he was traded back to the Red Sox in 1908. He put together three solid seasons as Boston’s starting first baseman but was faced with a career dilemma. He was doing much better financially with his banking career than he was playing baseball and he knew the wise personal decision was to quit the game and devote himself full time to the financial industry. That’s what he did after the 1910 season. Then in 1911, he was approached by the Red Sox with an offer to become player-manager of the team and a co-owner of the franchise. He accepted and led the 1912 Red Sox to an AL Pennant and a World Series victory over the New York Giants. Stahl started at first base for that ball club and hit a career high .301. The success didn’t last. By the following season he was done as a player and after quarreling with the team’s other owners over how the club was being run, he quit and went back to his banking career. Unfortunately, he pretty much worked himself to death, suffering a nervous breakdown in 1920 and then dying in a California tuberculosis sanitarium two years later, at the age of 43. He was known to his teammates and all of Red Sox Nation as “Tek.” He was brought to Boston with Derek Lowe in July of 1997 in exchange for reliever Heathcliff Slocumb, in what was the best trade former Red Sox GM Dan Duquette’s ever made. 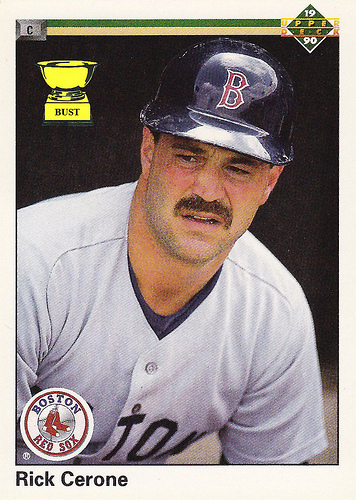 A switch-hitting catcher, who had been a two-time first-round draft choice (Twins-’93 & Mariners-’94) Varitek became the cornerstone on which Boston built two World Championship teams. There were better players than Varitek on those 2004 and 2007 Red Sox ball clubs, but there were no better leaders. Boston pitching staffs had complete confidence in his game management skills, he was one of the game’s premier defensive catchers and he had a knack of being involved in many of the important runs scored by those great Red Sox teams. He seldom smiled, never grandstanded and really didn’t say much to anybody except his teammates and especially his pitchers. I liked him a lot. He’s a native of Rochester, Michigan who moved to Florida during his childhood and attended college in Georgia. He also played for USA teams in both the Little League World Series and the Olympics. He ended up playing 15 seasons at Fenway and by the time he was done, Varitek had established himself as the greatest catcher in Red Sox history. 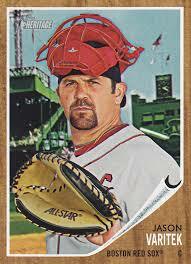 It really was hard for Red Sox fans to watch this great warrior grow old. He became a part-time player during the last couple of seasons of his career and was just a shell of the hitter he had been. He waited till he was about to turn 40-years-old to announce his retirement, just before the 2012 regular season began. Boston’s front office has yet to find the next Varitek. It will be a very difficult and challenging search. Trot Nixon, a former teammate of Varitek and another Red Sox “Warrior,” shares his birthday. This New York City born catcher was a horrible hitter, who had good enough defensive skills behind the plate that John McGraw kept him on the big league roster of his New York Giants ball cub as the team’s third string receiver from 1921 through the 1923 season. He then went back to the minors for a couple of years before joining the Red Sox in 1926. He was actually Boston’s first string catcher that season but his .223 batting average and powerless bat earned him a ticket to St Paul, where he put together solid back-to-back offensive campaigns for the double A Saints. That earned him another call-up to Boston in 1929, where he became a team- and battery mate of his younger brother Milt, a right-handed starting pitcher who would put together a 97-164 record during his own 11-season big league career. They were the first pair of brothers to play on the same Red Sox team. In later years the Farrell’s (pitcher Wes and catcher Rick,) the Conigliaro’s (outfielders Tony and Billy) and the pitching Martinez brothers (Pedro and Ramon) would be added to the list of Red Sox siblings who shared the same Fenway dugout during their careers. That 1929 season turned out to be Alex Gaston’s last one in the Majors. Though he was 36 years-old at the time, he would keep on playing at the minor league level for another nine years before becoming a successful insurance salesman. He passed away in 1979, at the age of 85.